Let's get one thing right out in the open: I'm all for lab-grown food. I think that lab-grown meat and burgers, for example, could soon become a great way to circumvent a lot of the environmental and ethical problems of today's meat industry. But I think we can all agree that if our foodstuffs were ever to sprout eyes, or teeny mouths, most of us would probably be more than a little wigged out. 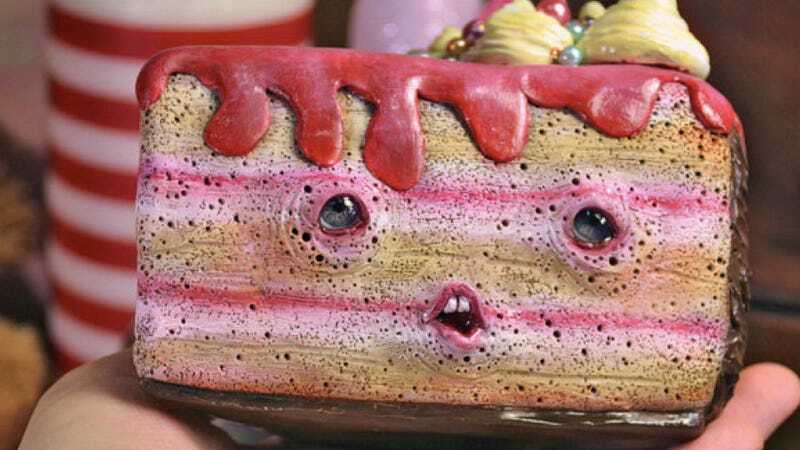 Case in point: Fresalina Limoneta, a adorable disturbing little slice of anthropomorphic cake, created by Spanish sculptor and doll-maker Sandra Arteaga. Can you imagine sticking an 8" round of cake batter in the oven, only to pull it out, slice it up, and discover Fresalina staring back at you? Just look at those glassy eyes, that slightly askew little mouth. Is it laughing at you, or weeping in moist-cakey sorrow? Nobody knows. What I do know is that eating something like this would be completely wrong, right guys?